To ensure it is a fair and accurate assessment for all examinees, the ACT Math test regularly undergoes extensive review. These reviews are performed by ACT staff and external consultants, whom work to ensure content presented on the test does not unfairly influence or disadvantage any group of examinees. Additional, periodic reviews and updates ensure the test content accurately represents classroom instruction as a predictor of college and career readiness. 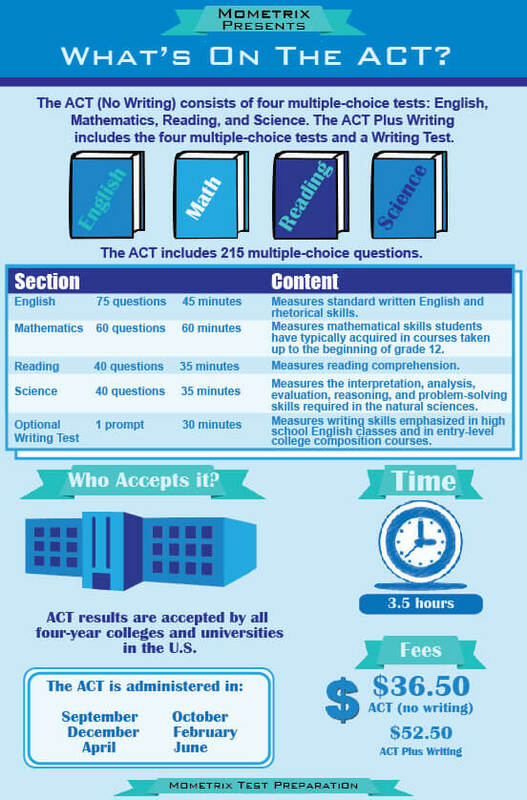 For this reason, content may have slight differences from the study materials such as ACT Math practice tests and study guides you use to prep for the ACT Math test. On the ACT Math test you will be given 60 minutes to respond to a total of 60 multiple-choice questions. These questions have been designed to assess your mastery of critical Math concepts by covering major content areas. These content areas are prerequisites necessary for the examinee to achieve success and perform well in entry-level college math courses. You will be expected to have basic knowledge of formulas and computational skills acquired throughout school up to grade twelve for these problems, but more complex or extensive formulas and computation are not expected on this test. For the test you will be given a bubble answer sheet to record your answers. You will be expected to fill in the respective oval on your answer sheet based on the number of the question you are responding to. Be sure to check that the number of the questions you are answering matches the number line of the oval with each question, especially if you skip questions to return to at a later time during the test. If you incorrectly fill in an oval, you can correct it by completely erasing it, taking care not to leave smudges which may otherwise result in errors when your test is scored. For your ACT Math test you will be required to show approved photo identification. You will also need to bring your paper ticket (for National and International ACT test dates), a permitted calculator, multiple sharpened soft lead No. 2 pencils, erasers and a watch without an alarm. Algebra (7-10%) – Graph, model and solve a variety of expressions by applying your knowledge of linear, polynomial and radical equations, in addition to exponential relationships and systems of equations. Functions (12-15%) – Apply critical features of graphs, and manipulate and translate linear, logarithmic, piecewise, polynomial and radical functions to portray your understanding of function application, definition, notation and representation. Geometry (12-15%) – Solve for missing values and use trigonometric rations and equations of conic sections to demonstrate your understanding of the composition of objects, including shapes and solids. Number and Quantity (12-15%) – Reason with numerical quantities, such as integer and rational exponents, matrices and vectors, to demonstrate your knowledge of complex and real number systems. Statistics and Probability (8-12%) – Analyze and apply data collection methods, calculate probabilities, describe center and spread of distributions and model relationships in bivariate data. Use modeling skills (evaluating, improving, interpreting, producing and understanding) across a variety of mathematical concepts, including those from each of the other reporting categories. Most examinees taking the ACT Math test will find that they have enough time to read, solve and respond to all of the questions presented on the 60-minute test; however, you should still plan to pace yourself with about one minute or less per question to give yourself enough time to review your responses or go back and solve more difficult questions at the end of the test. 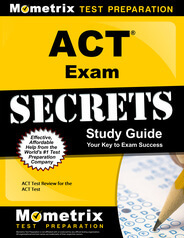 Remember that the ACT Math test does not ask you for the best answer, but for the correct answer. This means there is only one correct answer choice. To determine the correct answer, you will need to be familiar with and having a working knowledge of the ACT Math formulas you will use to solve ACT Math questions and equations. All of these questions can be solved without the use of a calculator, but calculator use is permitted if desired. You will have paper to perform scratch work as your solve the problems. Often times you will find yourself working through multiple steps to find the correct solution, so be cautious of errors and try to double check your work when time allows, especially if you determine a solution that is not among the available answer choices. As you prepare to take the ACT Math test, you should give yourself plenty of time to review and study well in advance of your scheduled test day. The content presented on the test is a reflection of the knowledge and skills you should have acquired over time, so cramming in the days leading up to the test will not be a productive method to improve your score. Instead, you should carefully make a plan and study in advance. This plan should include taking one or several ACT Math practice tests, not only to familiarize you with the presentation of the test and content you may encounter, but also to identify your strengths and weaknesses. This will allow you to determine whether you need to review certain ACT Math formulas or types of questions more heavily in order to achieve success. 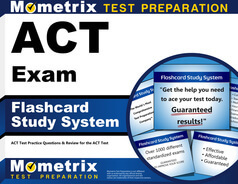 Once you have identified your current level of knowledge and skill, you can use the valuable ACT Math study tools available from Mometrix, including ACT Math study tests, study guides and other helpful resources.